Some weeks feel inextricably more difficult than they need to. This dish is the sort of winter tonic to show the negative energies I’ve a bit of sassafras yet. Moody, dramatic, a touch sweet, earthy. 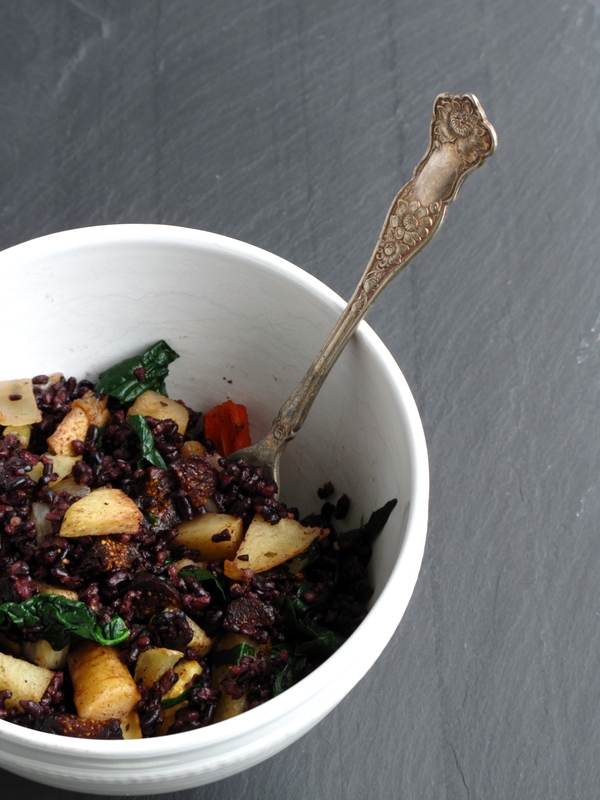 Roast up any combination of winter vegetables. Parsnips and celeriac are January favorites. Kohlrabi are clever, if elusive. They’re best found in a winter garden round these parts. Ask a farmer. Or your eccentric neighbor with a fondness for funky purple vegetables. Mushrooms make a lovely addition. Don’t forget the figs. They add just the right touch. Preheat oven to 400 degrees F. Prep the roots and toss them with the salt, a dash of black pepper, and olive oil. Roast until tender, 45 minutes or so. 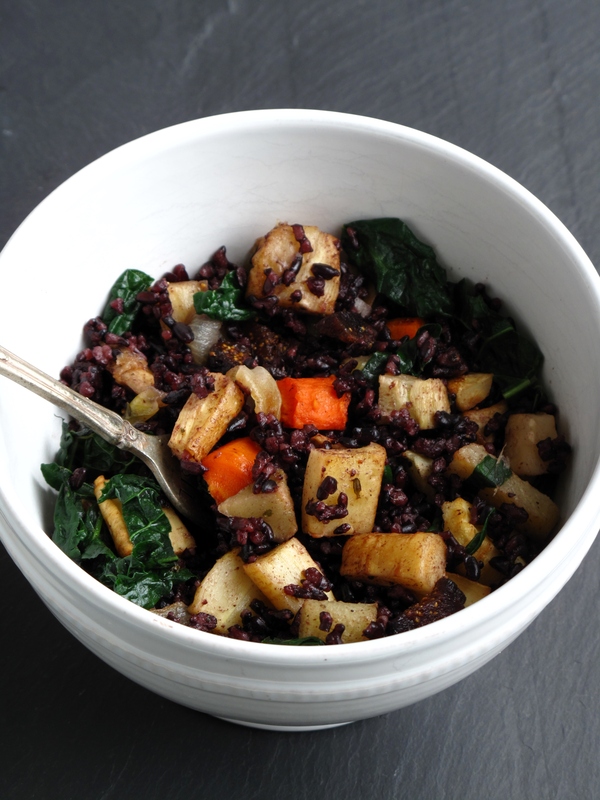 Meanwhile, combine the black rice and water and bring to a boil on the stovetop. Turn down to low, cover and cook for 40 minutes. 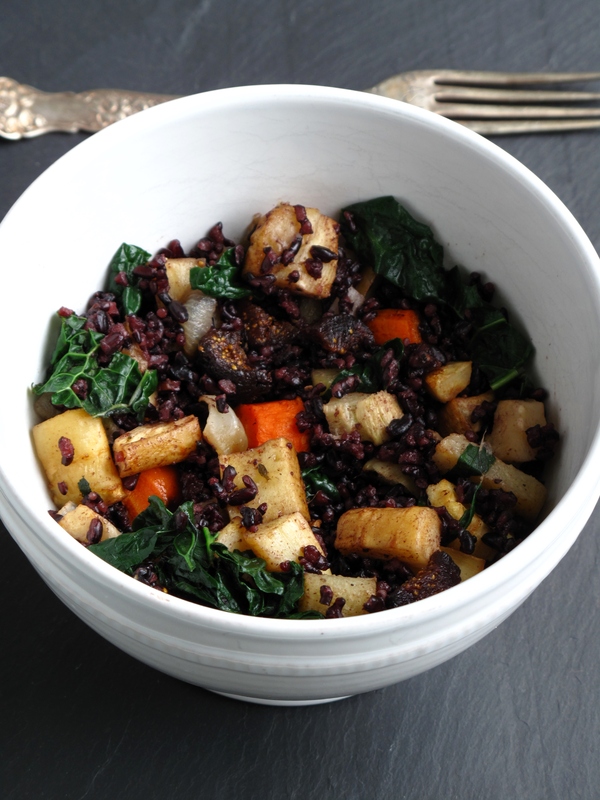 While rice and roots are cooking, dice figs, and prepare the kale. A couple minutes before the vegetables come from the oven, toss in the kale and allow to wilt. Then, remove the vegetables from the oven, toss with the rice, figs, and season to taste with salt and black pepper. There are few people I respect more than those who live each day in truth with their whole selves. I’m in awe of these folks and admire how they stubbornly live in their brassy, blunt, comfortably imperfect beings. I am not of those personalities. I tend to be quiet, small, and gauge how much I share with how well it will be accepted. If feathers will be ruffled or judgement passed, I opt to keep my mouth shut. I’m one that avoids controversy and negative attention. I like to be perceived as put together. These last few months I’ve been working on letting go a little: Being me without so much filter. Wearing less camoflouge. Going out in public in whatever I happen to have on. Saying things I mean. Sharing parts of me that I previously shoved away into dark little corners. In my food-world, I liken this process to embracing the ugly vegetables. William is working on an awesome organic vegetable farm this summer and he brings home bags of crooked carrots, too-ripe peppers, and weedy leaves. If truth be known, I have a fondness for the most interesting produce cast-aways. A perfectly straight carrot? An apple that has more beauty than flavor? A purely symmetrical tomato? Perfection in the botanical world is boring, sterile, and dare-I-say-it, industrial. Blemishes have their own unique beauty and the taste, what’s inside that really matters, is rarely sacrificed. If it’s so exciting to embrace ugly produce, why is it like hurdling mountains to get along with personal imperfection? Tough experiences leave scars which make the good days shine all the more brightly. They leave a life rich with experience. And wisdom. Exposure to another viewpoint and belief encourages acceptance and understanding. Having a different opinion is some sort of individualistic awesome. Critisism can be a catalyst for growth–Or expelling bad juju. Casting aside worry of another’s judgement is liberating. Self-acceptance is the best form of freedom. Back in the kitchen, I’m working with golden heirloom tomatoes of an unknown variety–they were too ripe to sell. I’ve seedy, scarred eggplants, and yellow summer squash from my garden. My squash plant is dying so these are likely the last ones for the summer. I’ve Jimmy Nardello peppers that didn’t come up to size and missshapen bell peppers, still green, which came off with a broken stem from overenthusiastic weeding. There are gorgeous red onions too. I’ve no idea why but they didn’t pass the farm’s to-market test. As for me, I’m working on being real,worrying less about measuring up or missing out. I’m working on embracing the ugly vegetables in my personality, the crooked roots and misshapenness. I’m working on letting the unique beauty that is the real me overpower the pursuit of being perceived as polished as a tasteless red apple. We are all glorious in our imperfection. Let’s celebrate a little more of that today. 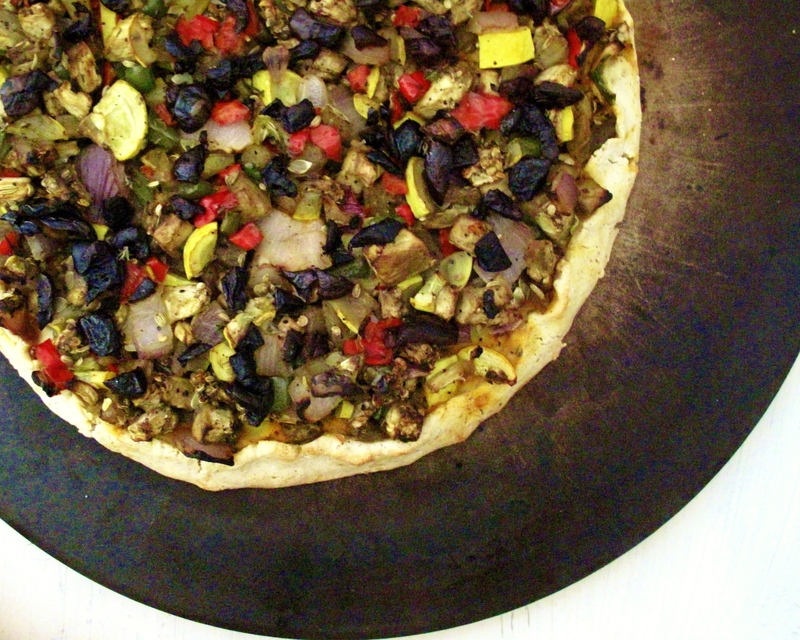 And eat pizza loaded with a bunch of ugly vegetable cast-aways. 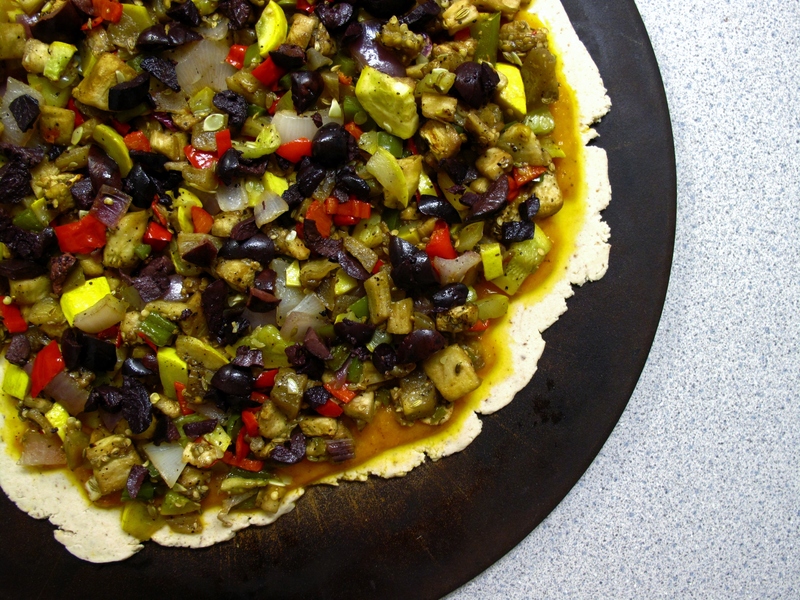 – Preheat the oven to 425 degrees F. In a large baking pan lined with parchment paper, layer in the chopped eggplant, squash, onion, and peppers. 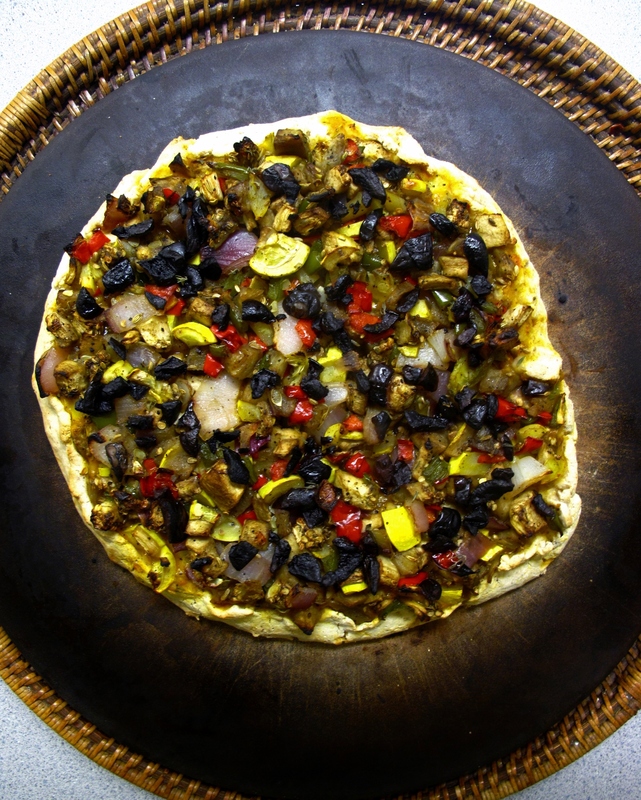 – Drizzle the mixture with oil, and toss in the fennel seed, freshly ground black pepper, and salt. – Give it all a good stir and then roast for about 20-25 minutes. – When the vegetables are sizzling and soft, remove from the oven and let cool slightly. 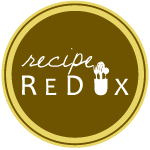 – Heat the oil in a medium saucepan over medium-high heat. When the oil sizzles, add the garlic and sauté until just golden. – Add the tomatoes and spices and turn to low. Simmer for 45-60 minutes. 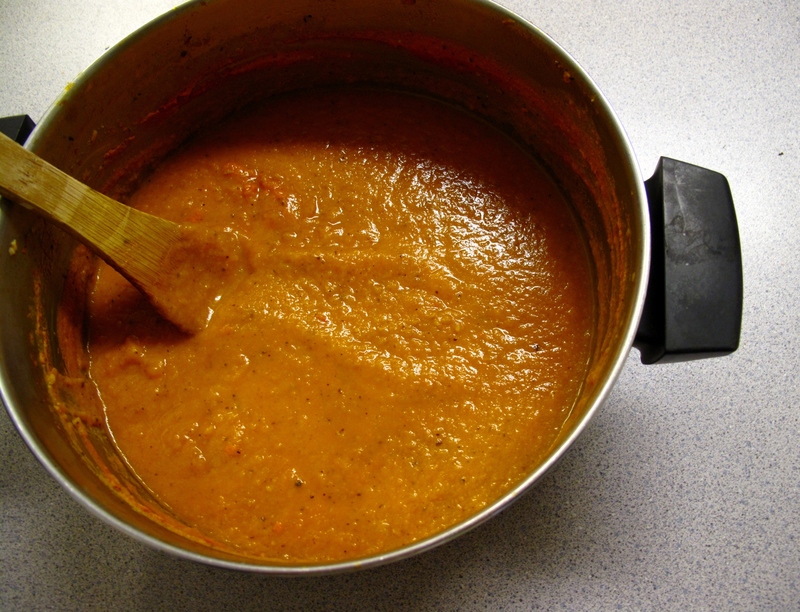 – Let the tomatoes cool for a few minutes and then puree in a blender for a smooth, pizza-sauce consistency. If the sauce is still quite thin, put it back on the stove and simmer a bit longer to thicken up. The ingredients below make enough for two 10-12″ crusts. Each pizza usually serves two to three. You can refrigerate the dough for the second crust up to two days. Due to the differences in the flours, I like to weigh them with a kitchen scale to get an accurate ratio of 70 percent whole grains and 30 percent starches. I’ve then put those weights into cups so it will be easier to measure without a scale, but if in doubt, I’d use a “short measurement,” rather than an overflowing cup. – Combine the flax seeds and 3 tablespoons of very hot water in a small bowl until a slurry is formed; set aside. – Combine the flours and salt in a large mixing bowl. In a liquid measuring cup, whisk together the yeast, 1 Tbs. olive oil, sugar and 1/2 cup warm water. Allow it to rest for 3 minutes or so until the yeast is activated. – Add the yeast mixture to the flour mixture, and stir it all up. Then add the flax seed slurry to the dough and a portion of the remaining water; mix until the dough comes together in a ball. If it is too dry, add enough water to for a tender, pliable dough. – Cover the dough in the mixing bowl and set it aside to rest for 1 hour. 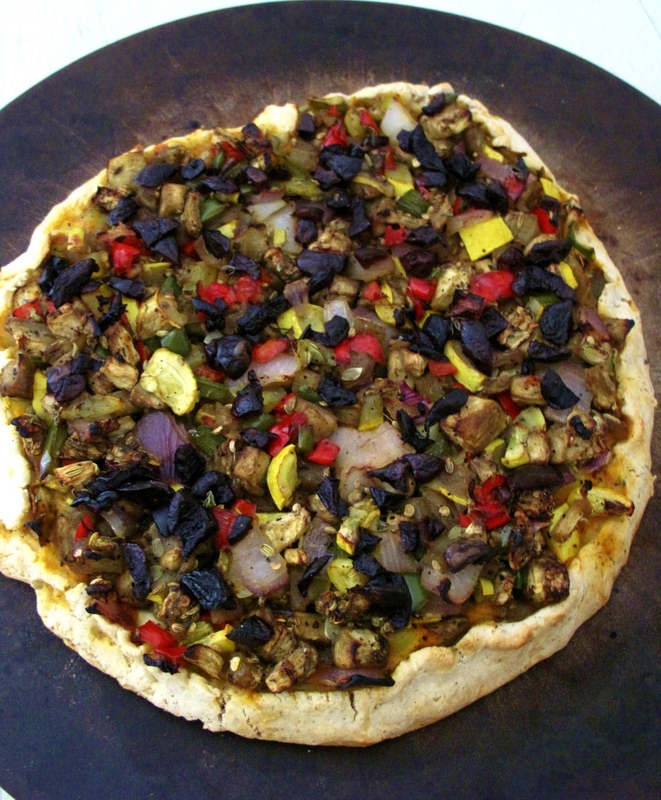 – Preheat the oven to 450 degrees F. Separate the dough into two equal portions. For each pizza, dust your pizza stone or baking sheet with a light sprinkling of cornmeal. 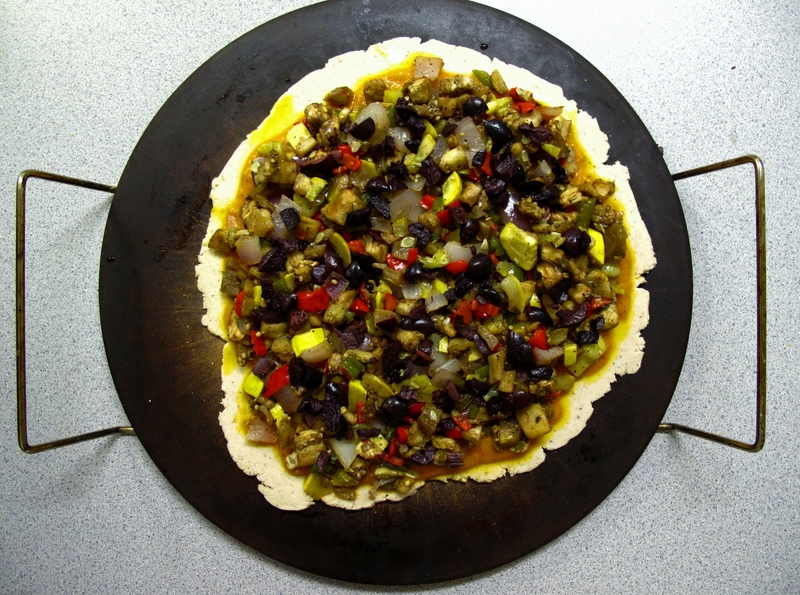 Roll one of the dough portions out to desired thickness directly on a pizza stone or baking sheet. 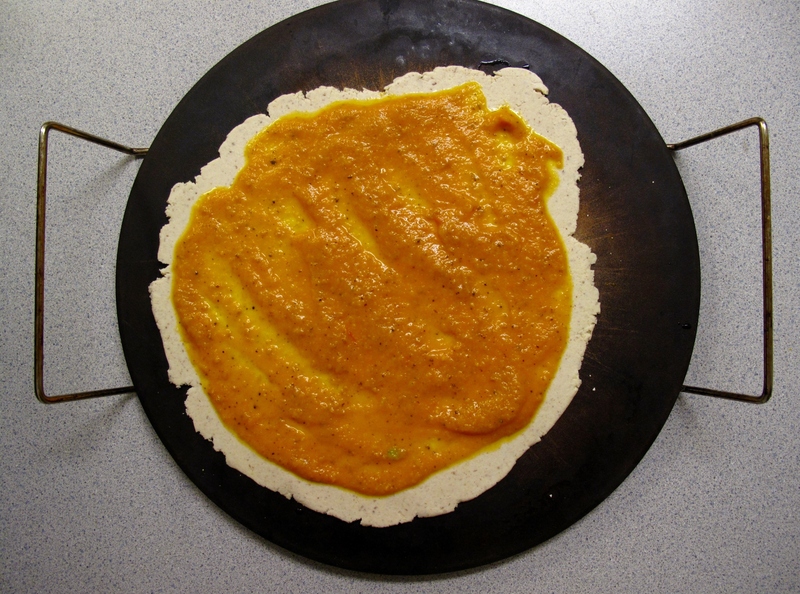 – Spoon a hefty couple of ladlefuls of the golden tomato sauce over the dough and smooth it out. 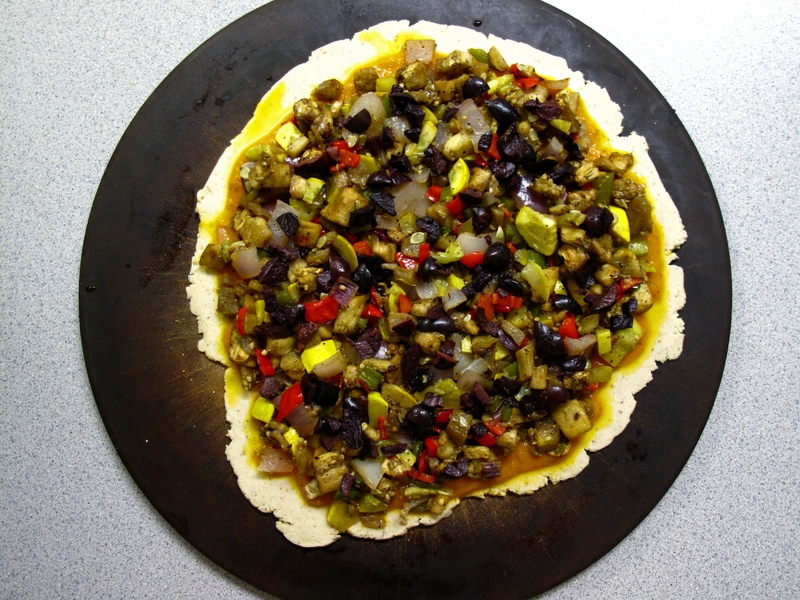 Then, layer on the roasted vegetables followed by the kalamata olives. If desired, crumble a sprig of fresh thyme over the top. Fold the crust edges in when done, and with your fingers, lightly dab the edges with the last tablespoon of olive oil. Pop it in the oven and bake for about 16 minutes.